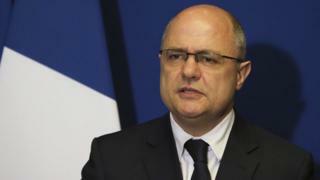 France’s Interior Minister Bruno Le Roux has resigned over a “fake jobs” row involving work he gave his daughters when they were teenagers. Mr Le Roux told a news conference that he felt it was his “responsibility”, but denied wrongdoing. It is alleged that his daughters were being paid for work while involved in other activities. The Socialist minister has repeatedly insisted that the summer jobs were legitimate. French President Francois Hollande said he had accepted Mr Le Roux’s resignation and named Trade Minister Matthias Fekl as his successor. Centre-right presidential candidate Francois Fillon is already under investigation for employing his family. Mr Fillon, initially the favourite to win the presidential election in April and May, is now running third in the opinion polls. In normal times this would be a monumental embarrassment for the French government. The interior minister has been found employing his two daughters as parliamentary helpers, and paying them a lot of public money. There may not legally be anything wrong with what he did – though the prosecutor will need to check that out thoroughly – but the look of the thing is awful. While still at school, these daughters of the French nomenklatura were able to start very substantial savings accounts. It would be embarrassing – but in fact the Socialist government is worse than a lame duck. It is a duck with both legs snapped at the knee. In the upcoming presidential elections, it has no representative. In a few weeks it will simply disappear. So the resignation of a minister is minor news. Except perhaps for Francois Fillon, who can hope to extract a little comfort from the discomfiture. Mr Le Roux, 51, said he did not want the investigation into the contracts linked to his daughters to “undermine the work of the government”. His daughters began working for him when they were 15 or 16, and between them amassed 24 fixed-term contracts that paid out €55,000 ($60,000; £48,000). The allegations against Mr Le Roux surfaced in the Quotidien TV programme on Monday, when a reporter approached the minister asking about holiday jobs he had paid his daughters for between 2009 and 2016. Employing family members is common practice in France’s National Assembly and is lawful. However, the programme reported that two of the contracts coincided with an internship and a pre-study course. One daughter held a three-month internship during the summer of 2013 at Belgian company Yves Le Rocher, Quotidien reported. Mr Le Roux’s office said all the jobs the girls were paid for were completed. “Of course I had my daughters working with me particularly during the summers or other school holidays, but never permanently,” he told Quotidien.